A papery covering over the fruit resembles a lantern. The genus Physalis includes many species in the nightshade family (Solanaceae). There are about 25+ species in North America. Of these, many are called ground cherries. The fruit of all these species is similar to a small tomato, but it is enclosed in a husk, like a tomatilla. The papery covering over the fruit resembles a lantern, and so ground cherry also goes by another common name, Chinese Lantern. Locally, the ground cherry I see most often is this one featured here. I believe it is Physalis virginiana, or Virginia ground cherry. It has a drooping yellow flower with a purplish-brown center. If you reach down to lift the flower up toward you, you will see that the corolla has five parts with pointed lobes. The leaves are alternate, lanceolate to ovate, entire or toothed, and sometimes slightly lobed. Many members of the nightshade family have poisonous leaves and stems, but most have fruits that are edible. Physalis has been used in chinese medicine for sore throats and infections. 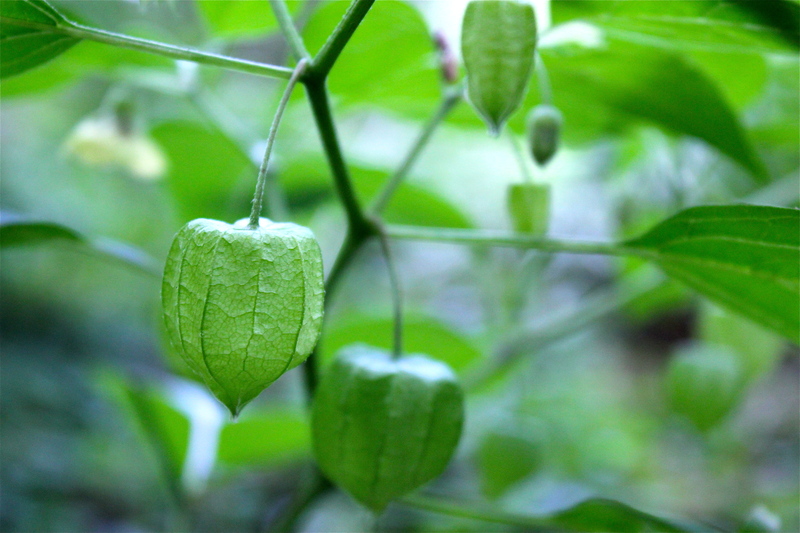 One species, Physalis subglabrata, is considered a hallucinogen. Virginia ground cherry is native to Virginia and can be found blooming along roadsides and in waste places in late summer.